We may earn money or products from the companies mentioned in this post. Merci! 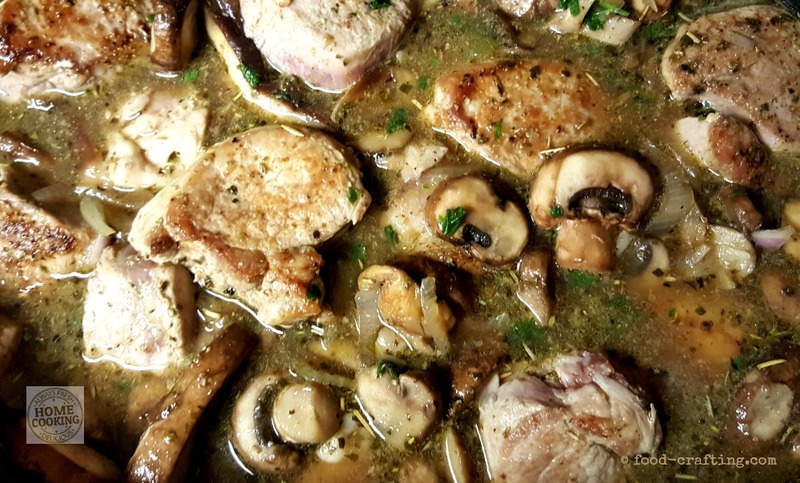 Braising Pork Tenderloin – This recipe for pork medallions (médaillons in French) in a rich mushroom sauce is the ultimate set it and forget it method to prepare pork tenderloin. 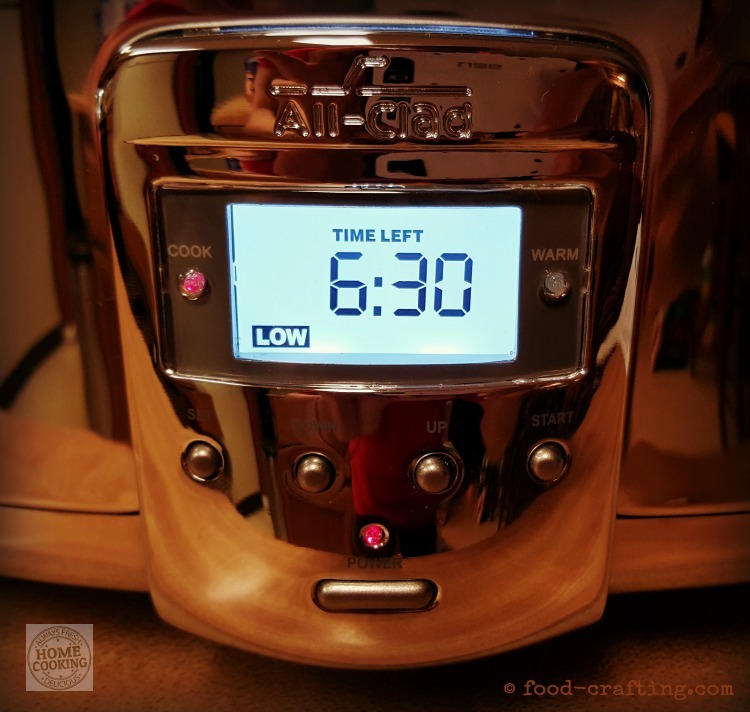 It is both quick and easy when using your favorite slow cooker! 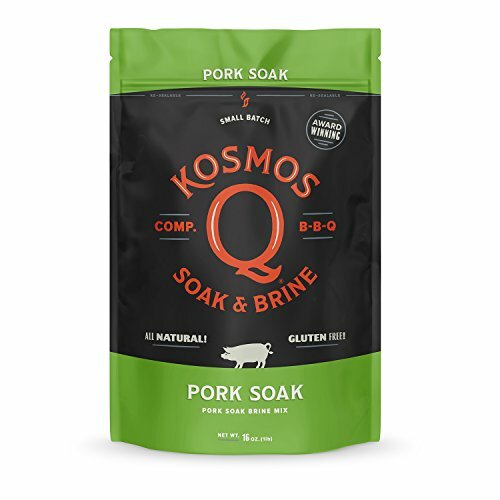 For this meal, the pork tenderloin is sliced into thick medallions and slow cooked to perfection. The creamy sauce is made from a reduction of the chicken broth cooking liquid loaded with mushrooms and shallots. 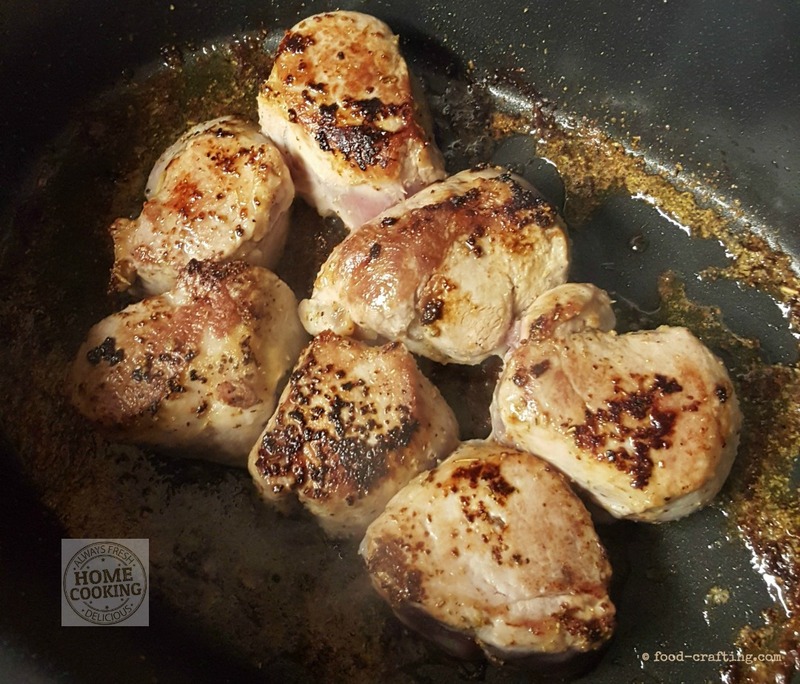 Why not try braising pork tenderloin for dinner instead of roasting, grilling it or preparing a stove top 30 minute meal? This recipe is easy to prepare comfort food – tender chunks of pork tenderloin bathed in a mushroom sauce. Serve with garlic mashed potatoes and fresh string beans or asparagus. It’s Sunday dinner in the making. The flavors in this recipe intensify overnight so be sure to prepare it a day ahead. I double Sunday dinner recipes so that I can pack several freezer meals for Mom and a certain someone who loves to raid the fridge of any leftovers, but you can just as easily divide the recipe. I do not hesitate to take any standard recipe and turn it into a slow cooker version but this particular recipe can also be prepared in a Dutch oven. You will have to watch the pot every so often. When preparing a slow-cooked meal, it is my personal preference to brown cuts of meat when called for in the original recipe. I follow the instructions as much as possible and improvise for certain steps. There are recipes where it is worth the time spent to brown the meat. Even if you have to brown the meat in a separate pan. 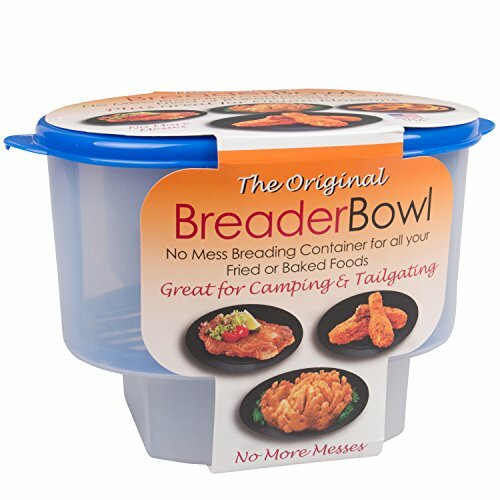 It means there is an extra cooking pan to clean, but it makes a world of difference in the flavor of the finished dish. The next best thing is a searing slow cooker with brown/sauté feature or, of course, an Instant Pot®! Brown The Pork Tenderloin First! 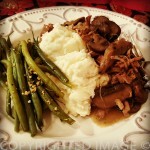 The braised pork tenderloin is one such recipe. It makes a world of flavor difference in the braised duck legs recipe as well! I do this often enough that my new slow cooker had to be one which featured a nonstick aluminum insert. 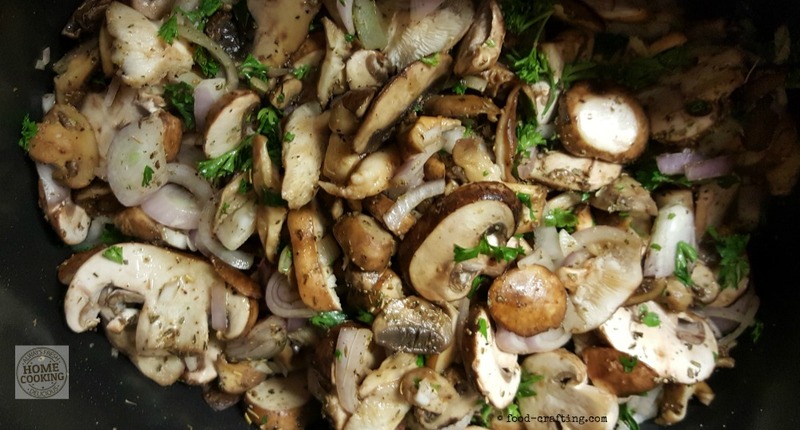 I sauté my meats, onions, mushrooms and other ingredients on the stove top and then simply pick up the insert and place it in the slow cooker for the remainder of the cooking process. If you cannot find the pork tenderloin already cut in medallions (as I was lucky enough to do), it is as simple as cutting the whole tenderloin into inch thick slices. As I cut the meat, I place the medallions on a paper towel and top them another paper towel. Pat down to absorb as much moisture as possible. When the surface of the meat is very dry, it will brown in a minimum amount of oil and butter. Resist the urge to peek. It takes about 3 to 4 minutes for it to turn golden brown. Braising pork tenderloin medallions is a quick and #easy way to prepare fork tender #pork in a creamy gravy loaded with mushrooms. Use a slow cooker or a Dutch oven. It’s Sunday #dinner in the making. 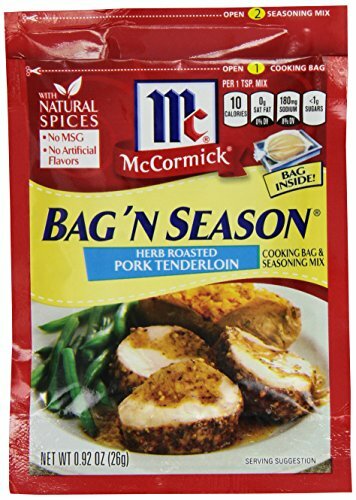 McCormick® Montreal Chicken seasoning, to taste. Brown the pieces of meat in batches turning them once to season each side with the McCormick® Montreal Chicken as they brown. Remove from the pan and set aside while you brown the remaining pieces. Add the mushrooms to the slow cooker insert. Allow them to brown a little, and then add the shallots, minced parsley, herbs and some salt and pepper. Brown the mushroom mixture until reduced by half in volume and nearly cooked. Nestle the largest pieces of meat in the mushroom mixture. Top with the remaining smaller pieces. Pour most of the chicken broth over the meat and mushrooms. The mushrooms will produce more liquid as the dish cooks. Adjust the seasonings if needed but I prefer to wait until the end of the cooking process. 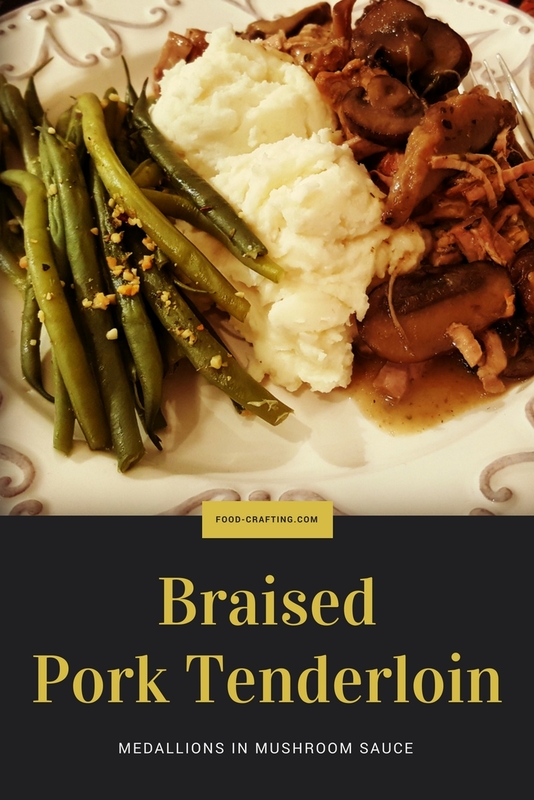 I rarely give amounts when it comes to salt and pepper for any recipe or even this recipe for braised pork tenderloin as I aiming for a lower sodium content to all my recipes. Add pepper to your heart’s content. There is more than enough sodium in the chicken broth and the Montreal Chicken® seasoning. Stir the contents of the slow cooker once about half way through the cooking period. It is not necessary, but it helps to distribute the meat and mushrooms evenly. Cook on LOW for about 7 hours. Remove about one cup of broth. Strain and set aside to cool along with the contents of the slow cooker. Refrigerate overnight. When ready to serve dinner – Reheat the meat and cooking liquid in a stove top dutch oven. It is much faster than waiting for the slow cooker to reheat. You may have to remove some of the liquid unless you want lots of gravy. Before the liquid has reached a slow simmer, stir the cornstarch mixture once again and pour evenly throughout the pan. Stir to combine well. When the sauce has thickened, and just before serving, carefully add the heavy cream. Stir well to distribute evenly. Dinner is ready! 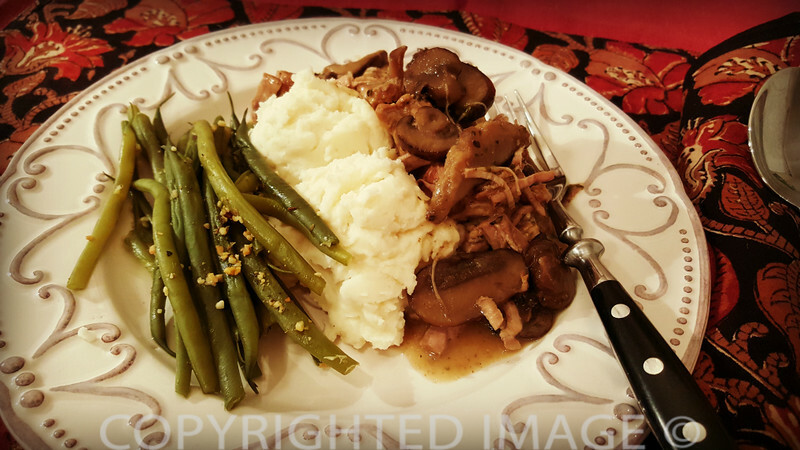 Serve the slow cooker braised pork tenderloin recipe over egg noodles, rice, steamed fingerling potatoes or mashed potatoes along with a side of buttery green beans. Voilà! 3 Brown The Pork Tenderloin First! 1 Cook, 2 Countries & A Taste For World Cuisines: Cooking A La Mode De Chez Nous - Cuisine d'Hier Et d'Aujourd'hui! For the love of home style cooking and great food. Memories are made of this! Previous Post Easy Caramel Apple Cake Recipe: Simple Box Cake Recipe Next Post Sausage Stuffed Tomato Recipe: You’ll Love This Easy Dish! De's Home Style Food Crafting (www.food-crafting.com) is a participant in the Amazon Services LLC Associates Program, an affiliate advertising program designed to provide a means for sites to earn advertising fees by advertising and linking to Amazon.com. error: Content is © protected ! !